London's burger scene has really upped its game in recent years, as US imports like Shake Shack and Five Guys have set the standard when it comes to quality fast food. We've got the lowdown on London's best burger joints, from a neon-lit dive bar to a fancy French bistro. 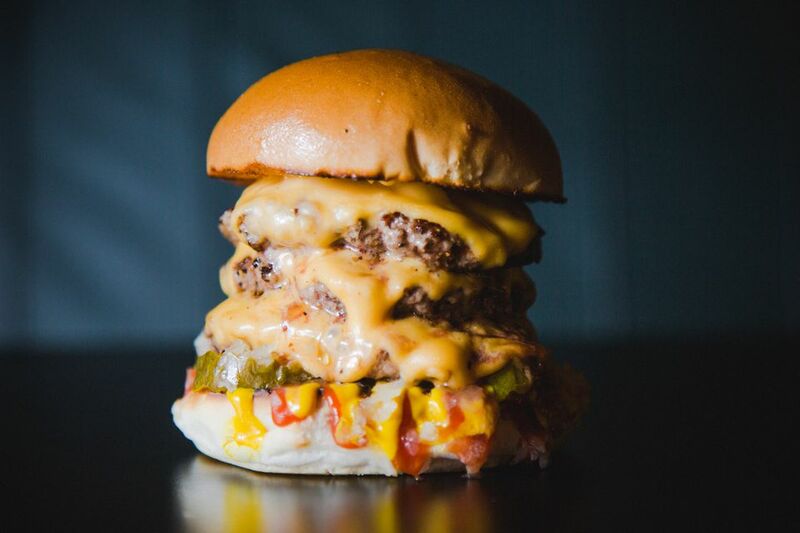 This prolific London burger brand started life as a food truck (the MEATwagon) in a south London parking lot. When the original Marylebone outpost first opened it had a cultish reputation for its dive bar vibe, graffiti-strewn walls and tattooed servers. The winning formula has been replicated across London and there are now branches throughout the city from Covent Garden to Croydon. All burgers are made from ground chuck steak and are served with a winning combination of red onions, pickles and mustard. The popular Dead Hippie sandwich features two mustard-fried beef patties topped with Dead Hippie Sauce. For the full monty order a side of fried pickles and a bowl of chili cheese fries. It stands to reason that one of London's best steak restaurants is also one of the best places to sink your teeth into a mighty fine burger. The signature Hawksmoor Hamburger is made from 100% grass-fed British beef and is topped with a cow's milk Ogleshield cheese or stilton and served with beef dripping fries. It's hard to resist this classic combo but the Kimchi Burger is a tasty alternative topped with short rib beef and spicy fermented cabbage. The burgers are only available on the bar menu (rather than the sit-down restaurant area) which is the perfect excuse to work your way through the impressive cocktail list. Purveyors of some of London's finest meaty sandwiches, you'll typically see all-day queues at the Patty & Bun outlets across London, an impressive feat for a business that started life as a small pop-up burger joint. Order the signature 'Ari Gold' which brings together a British beef patty, cheese, lettuce, tomato, pickled onions, ketchup and homemade smokey mayo in a brioche bun. Pair with a portion of fries dusted with chicken skin salt. Owned by the Soho House group, Dirty Burger is a small chain of chic burger joints in locations across London. The shabby but stylish interiors combine exposed walls, chunky tables and corrugated iron and the simple menu features just three options (a cheeseburger, a bacon burger and a veggie burger). All burgers are made from tender cuts of beef and bone marrow and are served with cheddar, tomato and Spanish pickles. Pair with a cold beer and a side of onion fries. Founded by a New York lawyer in 2012, Bleecker Street serves all-American burgers made with rare-breed dry-aged beef from small farms across the UK. All burgers are topped with a peppery secret sauce are are served between toasted seeded buns. The concept started as a pop-up truck that toured London's best food markets but there's now a permanent burger kiosk in Spitalfields Market and a 12-seat takeout joint in Victoria. Fancier than your average burger joint, Haché (meaning chopped in French) started life as a small family-run restaurant on a nondescript lane off Camden High Street. The intimate space features beam ceilings and chandeliers and the excellent drinks list is loaded with fine wines and French lemonades. Classic burgers are made with prime Scotch beef and are served on a brioche or a ciabatta roll with a signature mustard mayo. Feeling indulgent? Add truffle shavings and truffle aioli to your burger, or order the Steak Le Fume which is presented in a smoke-filled dome at your table. Founded by Icelandic foodie Tomas "Tommi" Tomasson (known as the man who introduced hamburgers to Iceland), Tommi's Burger Joint is fun, flavorful and affordable. Budget-conscious eaters will love the regular meal deals and discounts for students and families. The classic burgers are a mixture of rump, rib-eye and fillet and it's worth splashing out an extra £1 for a pot of bernaise sauce or chipotle mayo to slather on top. The simple menu offers a selection of craft beers, including Icelandic brews, and the interiors (film posters, fairy lights, handwritten cardboard signs) are inspired by New York's legendary Burger Joint, hidden away in Le Parker Meridien.